As spring rolls around, deadlines loom for coveted summer internships. AN has collected a list of five prestigious firms that are looking for their 2011 class of interns. Good luck! SOM has designed some of the most iconic buildings of our time, from the John Hancock Center and the Sears Tower to Burj Khalifa in Dubai. Send your cover letter, resume and 5-8 work samples (8.5” x 11”) to SOM’s Human Resources Department at 14 Wall Street, 24th Floor, New York, NY 10005. Only hard copy submissions will be considered. Gensler is offering several internships in architecture, interior design, marketing, graphics and planning in Dallas, Newport Beach, San Diego, LA, Denver, Houston, and Morristown, NJ offices. Most of the internships listed online are accepting students enrolled in professional degree programs only, but check the qualifications on the company’s career website. Deadline: April 22 for architecture internships in Atlanta and NYC, but deadlines are specific to each types of internship. Perkins+Will’s portfolio includes Chase Tower in Chicago and Antilia in Mumbai, a 27-story structure that’s one of the most expensive personal homes in the world. The firm’s paid internship program currently has five openings in interiors, architecture and urban design+landscape architecture. The internships are based out of in their Atlanta and NYC offices. Submit one complete PDF with a cover letter, resume, and up to a total of three pages of design examples no larger than 4MB through the company’s website. HOK has openings for summer architectural interns in its St. Louis and Chicago offices. Interns will have to opportunity to 2D and 3D presentation/design drawings, and create models/project boards for client and project team review. According to the website, the full-time summer internships are generally paid. The firm also offers a sustainable design internship program. Apply online. 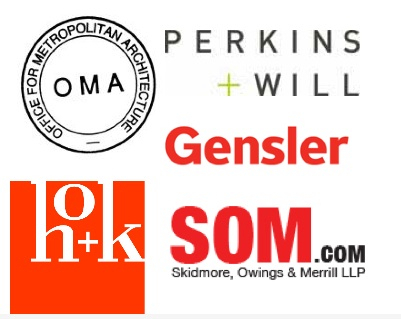 Last week, OMA announced two new internship opportunities. The Dutch firm is looking for a business development intern and a model shop intern for their Rotterdam office. They also have model shop and architectural internships available in their New York office. Internships in both departments are paid.